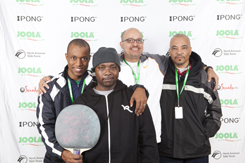 This year the JOOLA North American Teams Table Tennis Championship is celebrating its 15th Anniversary and we’re looking forward to commemorating this milestone with you! Organizing and running the largest competition in North America is no easy task, but your participation and continued support have been invaluable throughout the years. As a thank you to our loyal participants, we have prepared some gifts for our players! Each year, over 200 teams enter the tournament, adding up to about 1,000 players in total. With such a grand turn out it’s only appropriate that we match it with an equally spectacular venue. 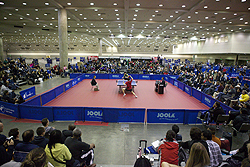 As a result, players spend three days competing on nearly 150 professional grade tables in a spacious hall of 150,000 square feet. The unique tournament format offers players a rare opportunity to play on a team, where they can coach and cheer for each other, and reconnect or meet different competitors. We are particularly proud of the player diversity of the Teams, featuring competitors from five continents, multiple countries, and scores of US cities. During this three-day competition, we are confident that you will have the chance to play more matches than in any other tournament you have experienced. Last year, the average number of matches per player was approximately 20, making the event a premiere opportunity for match practice! ties against other teams [each tie is the best of nine (9) matches and each match is the best of five (5) games!] in what we call ‘Preliminary Group Play’ or ‘P-Groups’. Then, Friday’s results are used to create ‘Final Divisional Assignments’ for Saturday and Sunday matches. Generally, participants will play an additional six (6) to eight (8) ties over those two days, so that by the end of the long weekend, all teams will have had at least 40 and as many as 108 matches! Based on the design of the tournament, most matches should be highly competitive. Friday’s results will dictate the Final Division Assignments, where teams will be grouped with other teams similar in playing level. Although opponents may be taller or shorter, older or younger, be warned that they will likely be stiff competition. The highest level of competition, the ‘Elite Division’, is where the tournament’s best players will be competing for the big cash prizes. We’ve had Olympians, National Champions, world-ranked players, and even a World Champion or two out on the floor, playing in the same event you’ll be in! The Quarterfinals, Semifinals, and championship matches are scheduled on Sunday to give as many of you as possible the chance to become spectators when ‘the best meet the best’! Try to get there early to make sure you have a seat because it’s not everyday that you get the opportunity to watch such high level play from such close proximity! official tournament hotel, the Hyatt, will be offering additional discounts and raffle prizes to our attendees (see last page)! Moreover, for those of you who want to explore the city, Baltimore’s inviting Inner Harbor boasts famous restaurants, museums, shops, and other attractions! Baltimore, Maryland has several nicknames but none is more appropriate than ‘Charm City’. The city has a colorful history and is full of attractive and interesting destinations. To help you navigate your trip, the Baltimore Visitors Bureau is ready and waiting to teach you about the local attractions and how to find them! Whether you want to visit the National Aquarium, see the birthplace of the Star-Spangled Banner, go clubbing at the Powerplant, try Maryland’s famous Chesapeake Bay seafood, or simply relax quietly with a plate of stuffed grape leaves, Baltimore’s resources will help you find it. Feel free to do some investigating ahead of time at BVB’s Facebook page, www.facebook.com/BmreMD, or sign up for the city’s tweets, @BaltimoreMD. You can even download an iVents Baltimore app to your smartphone at www.baltimore.org/app to stay connected! If your team is eligible for the prizes offered for Women’s, U-18 Boys’ or Girls’, or O-40 Seniors’ teams, please circle the appropriate team type. To Qualify, all the teammates must meet the category’s criteria! The age cut-off date is November 28, 2012 for juniors, December 31, 2012 for seniors. All teams will be placed into one draw and divisional prize money as stated will be given to the team with the highest finish in the tournament for that particular division. Entries must be postmarked by Friday, October 26, 2012. Any late entries will be accepted on a space available basis with a $100 late fee. If an entry is submitted late, please call to confirm that it was received and accepted. There is a $75 penalty for returned checks. NO REFUNDS after October 26, 2012. Tournament T-shirt and Program will include all team names sent in postmarked by October 26, 2012. T-shirts will be provided to each participant at team check-in. Extra T-shirts will be available for purchase at the tournament and come in sizes Small to 3X-Large for $20 each. It’s hard to believe that the Hyatt Regency Baltimore has already been the Official Tournament Hotel of the Teams for 15 years! 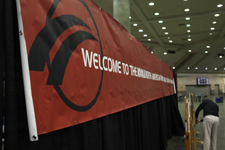 Each year, they have gone above and beyond to make this event as comfortable and affordable as they can for our guests. Teams participants get an outstanding discount on the room price, a rate of $109/night for double occupancy and an amazing experience. The Hyatt has stunning harbor views, excellent food, and an unbeatable location, as it is connected by Skywalk to the Baltimore Convention Center and to the Light Street Pavilion, the Inner Harbor shopping destination. 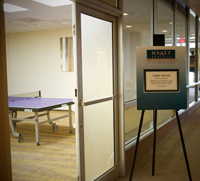 During the Teams, the Hyatt is focused on the tournament and player experience. An exclusive game room, complete with a JOOLA Table and a video game console, will be available to our guests. As an additional incentive to choose this fine hotel as your residence for the tournament, the Hyatt is also offering prizes to be raffled off to guests to book into the tournament’s discounted room block before the Early Bird Deadlines. Book your room before the Early Bird Deadlines and be entered to win. Details below. Reserve a room by the dates below to win chances for 55 awesome prizes from the Hyatt! August 1: One prize will be awarded to each of 25 winners, who will have first choice at the prizes. September 1: One prize will be awarded to each of 15 winners, who will have first choice at the remaining 25 prizes. Those who made reservations by August 1, but did not win, will be eligible for this round of prizes as well. However, they will receive an additional 4 entries, so that the ratio of entries for guests who made reservations by August 1 to guests who made reservations by September 1 will be 5 to 1. October 1: One prize will be awarded to each of 10 winners, who will be able to claim the remaining 10 prizes. Those who made reservations by August 1 and September 1, but did not win, will be eligible for this round of prizes as well. However, guests from the August 1 wave will receive an additional 9 entries and guests from the September 1 wave will receive an additional 4 entries, so that the ratio of entries for guests who made reservations by August 1 to guests who made reservations by September 1 to guests who made reservations by October 1 will be 10 to 5 to 1. We’ve teamed up with Super Shuttle to provide some great discounts on transportation from and to the local airports. Visit this page for more information and how to book your transportation! Unos will offer any player that shows their player/spectator badge a 10% discount (excluding drinks). 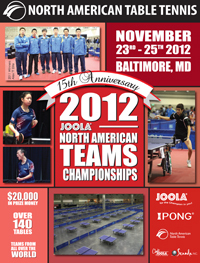 The 2012 JOOLA North American Teams Table Tennis Championships will be held at the Baltimore Convention Center, centrally located in Downtown Baltimore’s Inner Harbor District! There are great attractions, plenty of shopping, great seafood, and lots more to do!